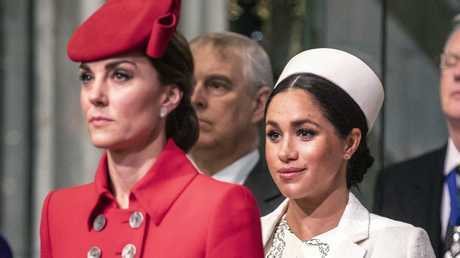 "I think what Meghan has got to realise is that she cannot live life in the royal family like an A-list Hollywood star and that within the monarchy it demands a very different set of behaviours," Anna Pasternak, author of The Real Wallis Simpson,sniped on The Royal Box. "She doesn't understand that she cannot be this international star on this global stage, that is the Queen, then Charles, then William and Kate - they have to be the stars that's what ensures continuity in the monarchy," Pasternak continued. "The house of Windsor has done incredibly well to stay together when many other European royal houses have collapsed, and they've done it because they recognise who has to be the main event," the author said. "She seems to want to bring her own style into the monarchy and I don't think that's appropriate and I don't think it's going to work long term." In fact, Markle wasn't an "A-list Hollywood star" before linking up with Prince Harry, with her career peak up to that point being a supporting role on Suits, a cable TV drama - and reports have said that Queen Elizabeth was "impressed" with her work ethic. However, several A-listers, including Serena Williams, Gayle King and Amal Clooney, came out for the Duchess of Sussex's baby shower in New York City in February. "I thought that was in very poor taste actually when the country is in a state of extreme anxiety and flux and many people are suffering financially I think you can't have it both ways," Pasternak griped. "I don't think you can on the one hand say to people, 'save the planet, save plastic,' and then be revving up a massive carbon footprint going for a lavish baby shower in New York. I don't think it looks good and I don't think it's appropriate. Pasternak also claimed to believe there's a rift between Markle and Kate Middleton and Princes Harry and William. "I think they're undoubtedly true. William is very responsible, he knows what his role is and Kate has come alongside that and executed that extremely well," she said. "I think it's quite difficult to have had Meghan who seems to want to modernise and set her own agenda and you can't have it all. You cannot have your freedom and this privilege, so it is a Faustian pact. It's not a fairy tale and [Markle needs to] recognise that and live with consequences." Still, Pasternak even blasted the odds of Markle and Prince Harry's marriage lasting, sniping, "Nobody wants to cast ill on a new marriage with a young baby but I think it's going to become increasingly difficult."